The figure 8 join is used to join two seperate pieces of knitting so they can be seamed. There are three steps to the figure 8 join. Insert the needle into the bottom of one piece either in the cast on edge or above the cast on edge from back to front. Insert the needle into the bottom of the opposite piece from back to front. If you went above the cast on in step 1, go above the cast on in step 2. If you went into the cast on in step 1 go into the cast on for step 2. Insert the needle into the exact same spot you inserted the needle in step 1 from back to front. If you fail to work the last step, you do not create a figue 8. Remember, as experienced knitters, it's often easy to "predict" or expect to see directions or things in patterns. And sometimes we read the directions, but our hands do something else, because subconsciously it might seem more logical or it's what we think should happen. This is what I think happens to many people when they try to work this join. Step one is correct, but step two the yarn is worked front to back rather than back to front. This makes a figure 0 and does not securely join the pieces. Step 1 and 2 are worked correctly, but in step 3 the needle is either brought up through the intial insertion poin and then under the first seaming bar. Or, the needle is brought under the first seaming bar on the original swatch. If you do this, you will seam the cast on row of the second swatch to the first row on the first swatch. They will be misaligned. The bottom will not lie straight. It gets even more disasterous for seed stitch, because the rows are now off by one and if you planned to carry the pattern over the seam, you won't, unless you make a fudge somewhere by working two bars from one swatch. Duplicate stitch is a technique for covering already knit stitches. It's good for lines and small areas. If the area is too large the item gets bulky, so duplicate stitch wouldn't be the best technique for that area. Intarsia or Fair Isle (stranding) would be a better choice. Many knitters work forward with duplicate stitch thinking how easy it is. The reality is it is one of the more difficult of techniques to get correct. To the astute, trained, review committee eye, errors stand out. Common problems are: Poor stitch coverage Twisting of stitches at the base Splitting both the working thread and base stitches Legs at the base of an end stitch don't separate, but rather lean in the same direction This blog post deals with the last problem. End stitches that sometimes appear twisted or have both legs leaning in the same direction. The problem occurs because the tail or working yarn is brought inward towards the stitch worked in that set. The solution is to anchor the stitch to the outside stitch by splitting the outside stitch slightly and then continuing forward with the tail weave or duplicate stitch. Below is what anchored stitches look like. The latest issue of Cast On Magazine includes my article on Types of Slip Stitch Knitting. Slip Stitch Knitting is a large category which includes different types of finished stitch patterns. Non-color dependent patterns-- Patterns that can use one or multiple colors but texture is the main focus. Color dependent patterns --Patterns must contain at least 2 colors and the emphasis is the color pattern created. 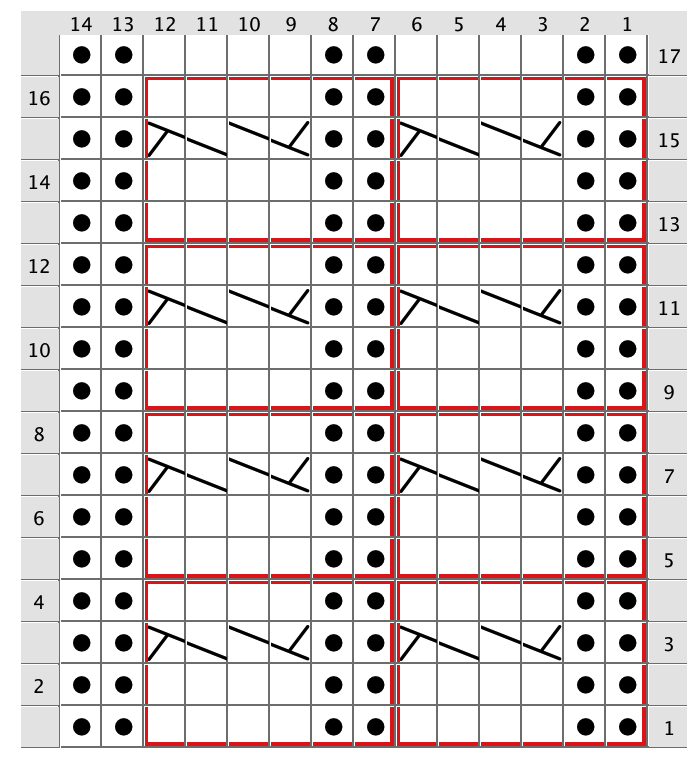 Mosaic knitting, a type of slip stitch work invented by Barbara Walker. Brioche knitting, a type of slip stitch work that uses yarn overs and slipped stitches to create layered, fluffy fabrics. These can be one or two colors. Double Knitted Fabric-- Typically worked in two colors but can be worked in a single color. Mosaic, Brioche, and Double Knitting use slipped stitches to create unique fabrics. 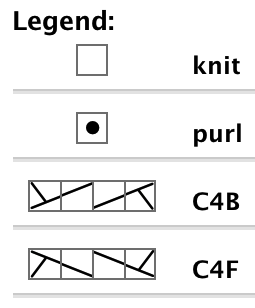 These sub-sets of slip stitch knitting are regarded as their own separate categories of knitting. They have characteristics that separate them from typical slip stitch work and are considered apart from Slip Stitch patterning. Most knitters can easily see the difference between Brioche and Slip Stitch work. It's also easy to see the difference between Double Knitting and Slip Stitch work. However, many knitters often confuse Mosaic Knitting and Color Slip Stitch Knitting. One color is worked at a time. Textured fabric is created. Colors are carried along the selvedge. Both use slipped stitches to create the patterning. Can be worked in rows and rounds. Creates its own fabric through the use of varying texture. Worked on a base of either stockinette or garter stitch. Uses small repetitive motifs. Patterns tend to be simple with short multiples and repeats. Patterns are geometric ranging from simple to complex. 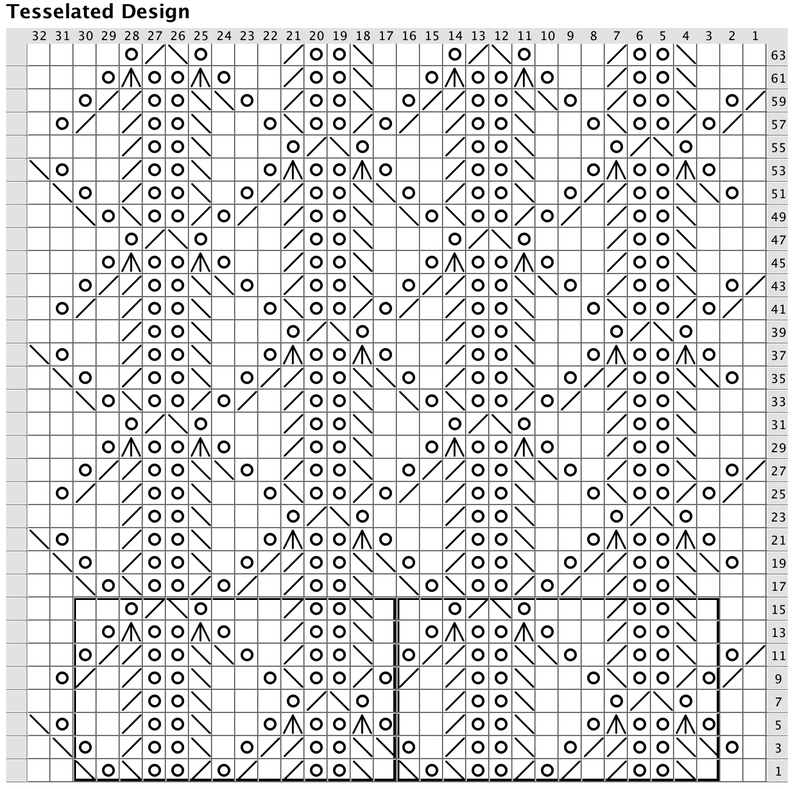 Multiples and repeats tend to be longer then typical slip stitch patterns. Look can vary depending on how much colors contrast. Can use 2 or more colors. Some patterns don’t require color. Most patterns work alternating colors using 1 strand similar to Mosaic, but there are patterns where more than one color is used per row using the intarsia technique. The 2 colors are alternated with one strand worked for 2 rows then the other color worked for 2 rows. Colors may be worked for 1, 2, or more rows and alternated in varying sequences. Each color is worked for 2 rows first on the RS then on the WS. RS and WS rows are usually different. WS rows are worked exactly as the previous RS row. Occasionally an accent stitch may appear. Stitches can be slipped both knitwise and purlwise, depending on the pattern. Yarn can be held to either the RS or WS of the work when slipping stitches. Yarn is held to the WS of the work when slipping stitches. Can be incorporated with other techniques. Does not combine with other techniques. Special borders have been created to work with Mosaics including Mosaic rib and Mosaic seed stitch. Because of their simplicity, row by row instructions work well and charts are generally not needed. 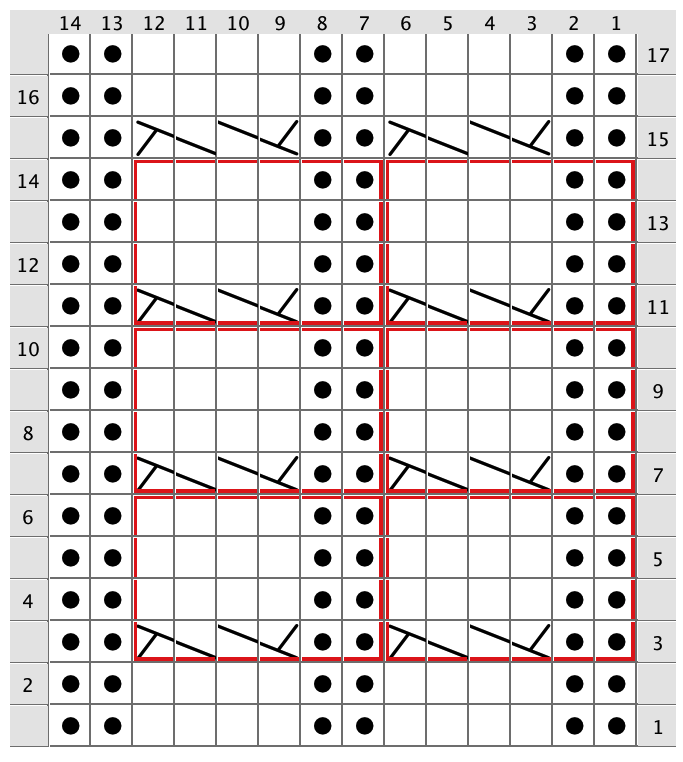 If the pattern is charted, then every row will be shown using standard charting technique, using a symbol for the slipped stitch. 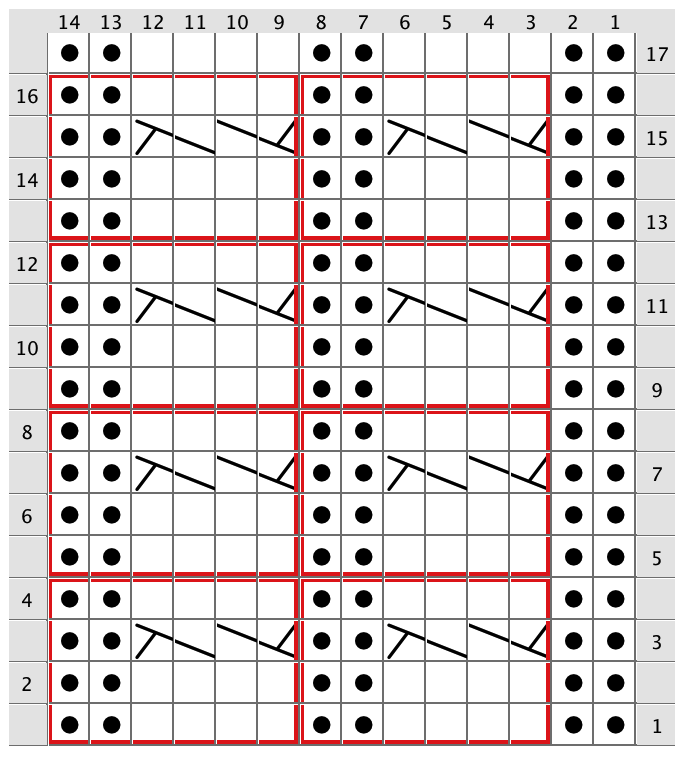 Employs a unique charting system developed specifically for Mosaic Work. Each row is read from right to left and then from left to right. There are exceptions. Charts are usually easier to read than row by row directions. 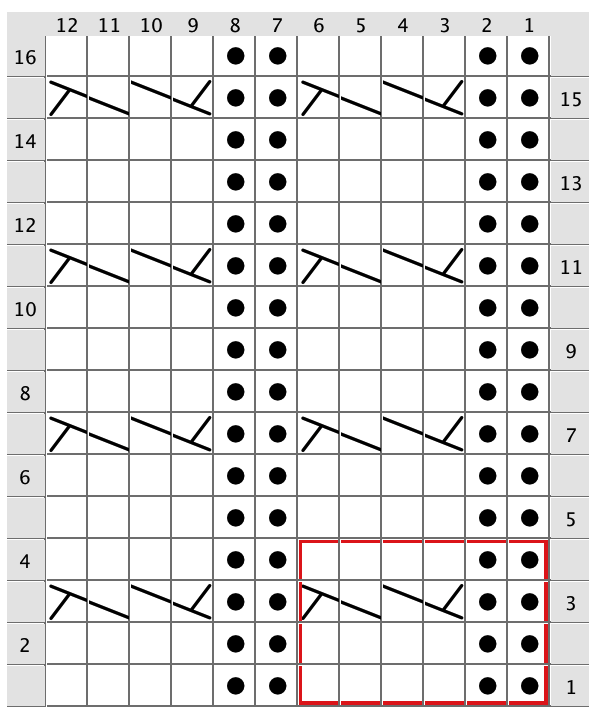 Typical chart will not use a symbol to designate stitch to be slipped. 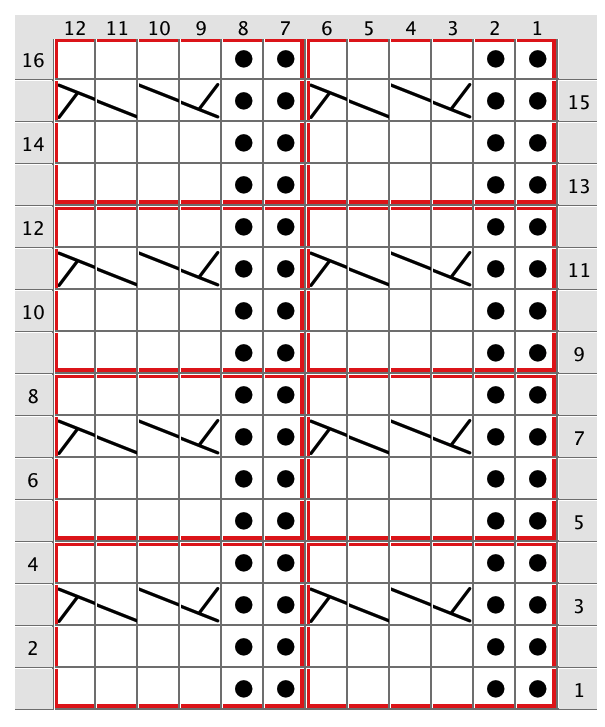 Notice that while the motif can be extended horizontally in all of the above examples, the design must extend vertically. In each example, one multiple or several multiples are possibilities. The design does not depend on having more than 1 multiple. I will use a cable for this charting and designing example. Did you notice the chart only shows RS rows? The pattern directions must state how to work all WS rows. In my design the cable needs to be worked 10 times across the row in order to get the correct size. I also need to use spacer stitches to separate the cables. I have determined that the cables will be separated by 2 reverse stockinette stitches. Remember, the multiple is the set of stitches that repeats across the row. The multiple will consist of the cable stitches + spacer stitches. There will need to be extra spacer stitches at the end of the row to balance the cable horizontally. The idea here is to begin the cable on the row that will best complement the design. Whatever row I choose now becomes the "row 1" of my pattern. The rows will need to be renumbered and charted accordingly. 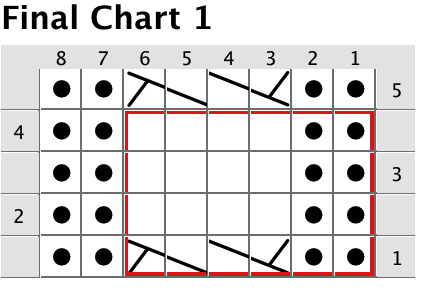 The directions in the pattern should state to begin all charts on row 1. 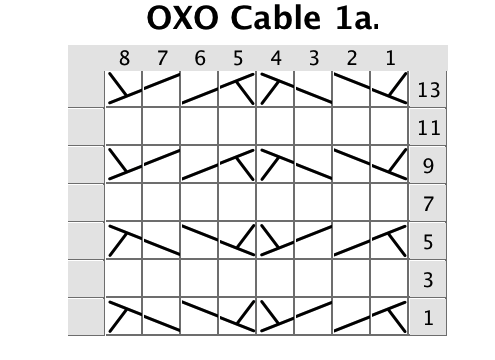 (There are exceptions) I decide that I want my cable to start with a complete O and end with a complete O---- Balance! 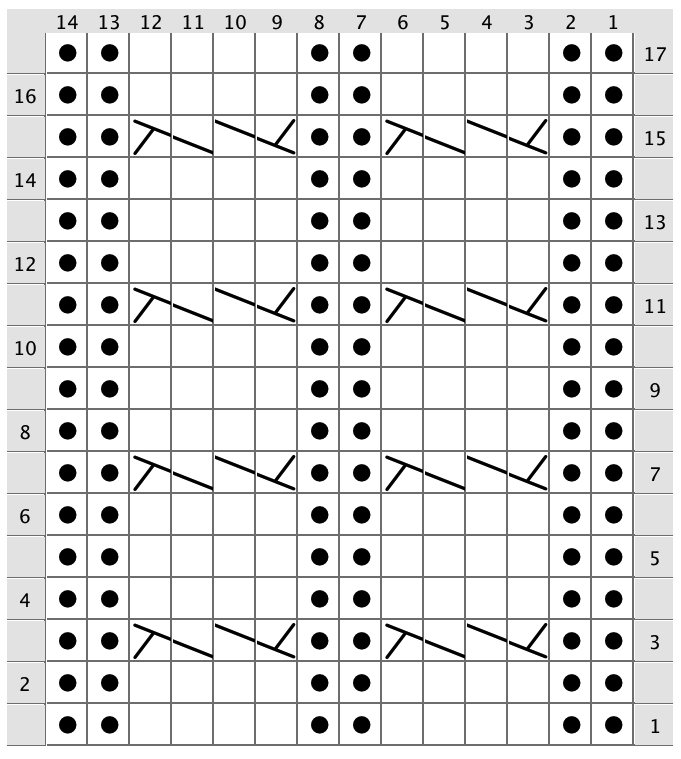 To do this I must start the chart as shown in the reference on row 5. Therefore row 5 becomes row 1 in my pattern. Identify 102 stitches where this chart should be worked. The green box needs to have some explanation. Directions for working wrong side rows. 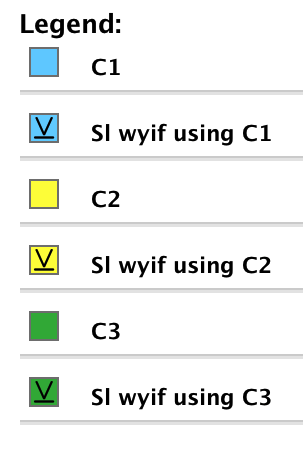 Directions for working C4B and C4F. I also must direct to work rows 1-14 but end by working rows 1-8. To chart any design, you must first understand the concept of using multiples and repeats. This is probably one of the hardest concepts when learning to design and write pattern. Once you get it, everything starts to fall into place. The definitions get a bit confusing for some people because the work "repeat" is used as both a noun and verb. 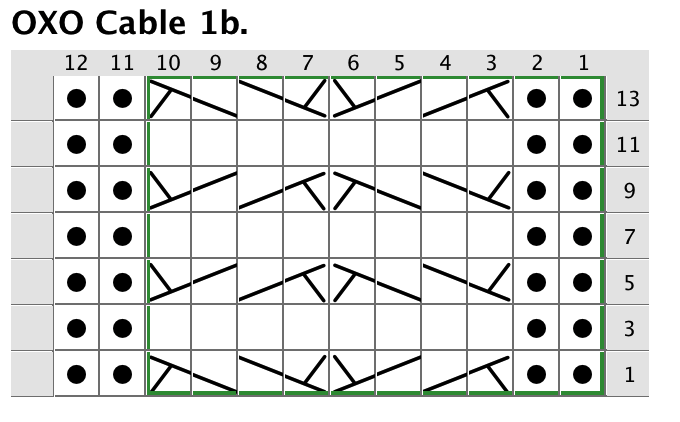 Multiple-- A set of stitches that repeat across a row. Repeat--A set of rows that repeat vertically. *Neither is set in stone. 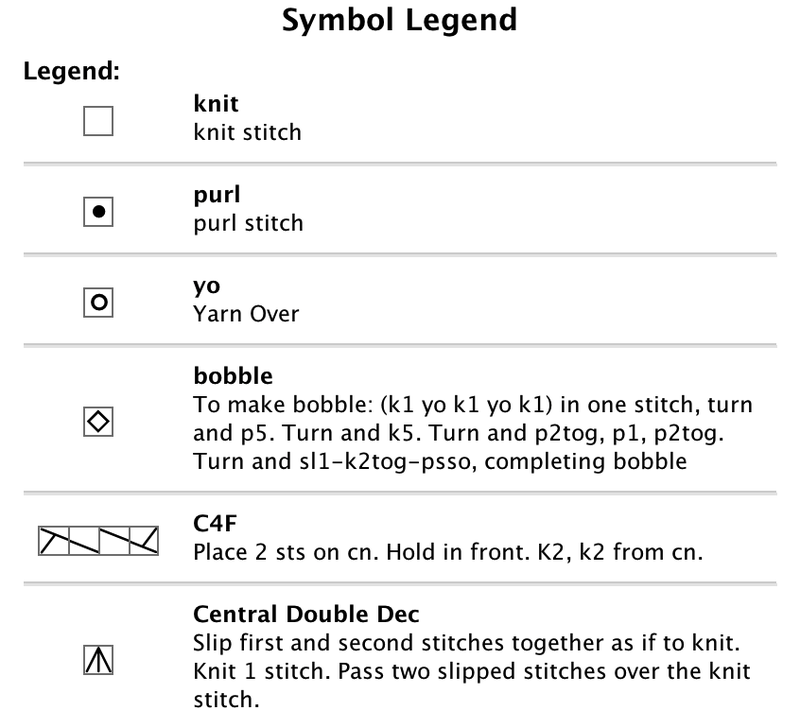 You can choose which set of stitches you want to delineate as the multiple. You can also rearrange the rows to suit your pattern. Stitches 1-6 repeat across the row so they are the multiple and rows 1-4 repeat vertically making them the repeat. Both could continue for as many stitches or rows needed. Problem 1-- The piece is neither balanced horizontally nor vertically. So where are the multiples and repeats? But this works as well. In both examples there are going to be extra stitches and an extra row. 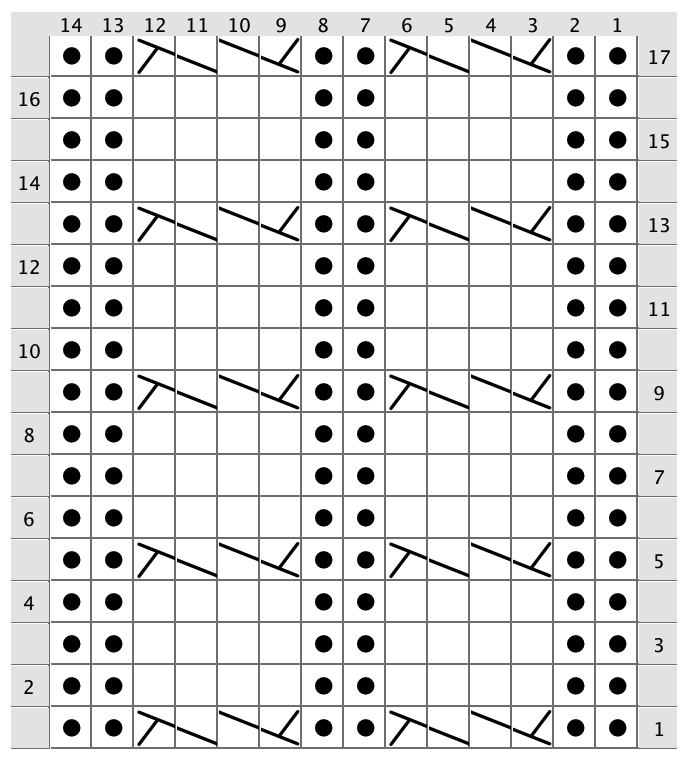 When you look at a stitch pattern either charted or written, you will often find that the multiple will be expressed before the row by row direction or chart. 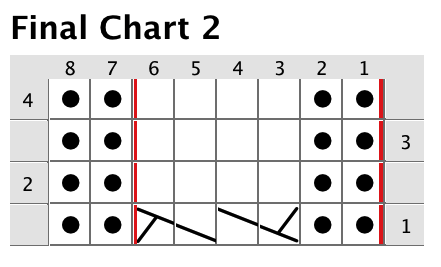 For the original chart the multiple was six. But,... for these bottom 2 charts the multiple is now 6 + 2. 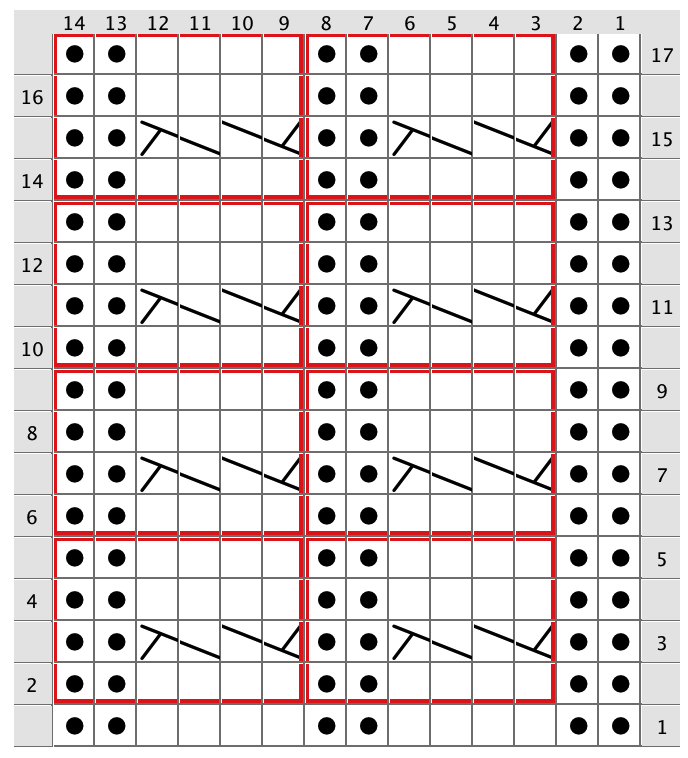 Six is the original multiple, the set of stitches that will repeat and 2 represents the number of stitches outside the multiple, needed to complete the pattern. Extra stitches are only worked one time on the row, either before the multiple is repeated across the row or after the multiple is repeated across the row. Typically the repeat (for rows) is not expressed. 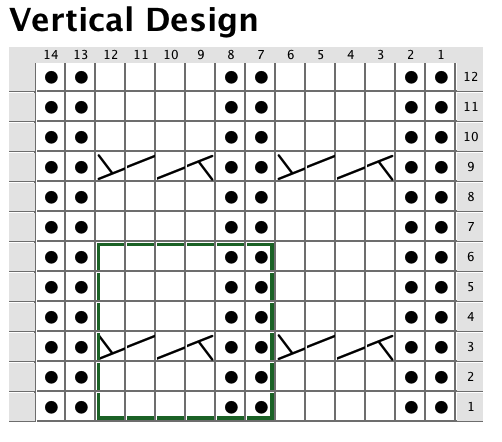 It is up to the designer or knitter to add the appropriate rows to the end (or beginning) of a pattern for vertical balance. The second example above brings us to problem #2. 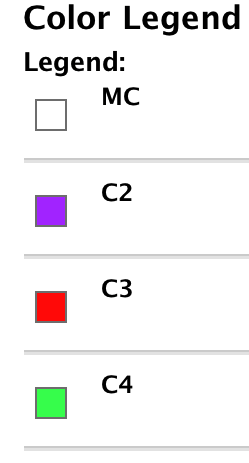 What if I want to rearrange the rows? So where is the multiple and repeat now? And just like our original example, the multiple could be shifted to the left 2 stitches. But the multiple will always be 6 + 2. Remember in Part 1 that I mentioned the main directions should state how to work the chart? The directions for chart 1 would instruct to work Final Chart 1 over a number of stitches that is a multiple of 6 + 2. (examples: 32, 602, 68) and to repeat rows 1-4 to a certain length ending with row 4 or to work rows 1-4 a specified number of times (the end length would be based on the row gauge for that piece) then work row 5 of the chart. I like chart 2 better. Here the directions would be similar. Work Final Chart 2 over a number of stitches that is a multiple of six + 2. 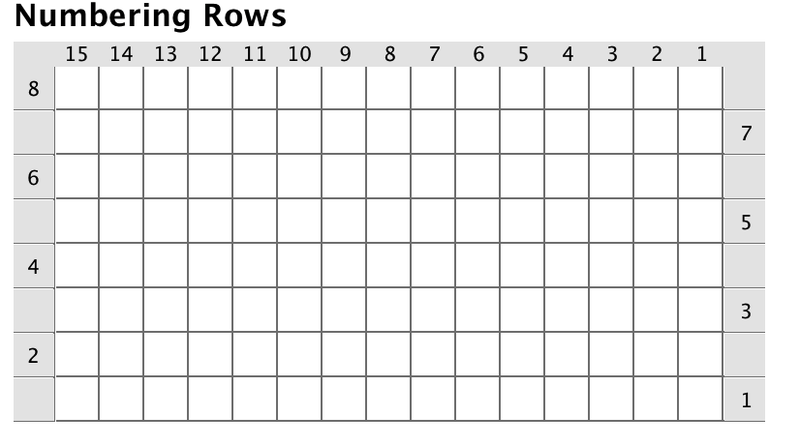 Cont working rows 1-4 to a certain length or a certain number of times, then work row 1 once more. Notice on chart 2 that I did not use a box. On this chart I only need to delineate the multiple. Boxing those stitches would be acceptable. But for chart 1 I must use the box, because here I must delineate the repeat. Knitting design requires the designer to take many things into consideration. One of those things is they type of stitch pattern or patterns to be used. There are many good design books and articles giving the wheres and hows to integrate the stitch pattern into the design shape and how to calculate the various sections as to stitch and row counts, increases, decreases, bind offs and cast ons. When charting you need to think more about the motif or stitch patterns you've selected. When I am designing it is easier for me to think about how the motif of the pattern moves. There are four ways: vertically, horizontally, both vertically and horizontally, or not at all. Color, texture, cable, and lace patterns all fit into four categories. Thinking about motifs in context of movement helps me better see the motif composition and helps me better balance the pattern. This makes charting easier. Other designers have their own ways of approaching this. This is my own method for working design. 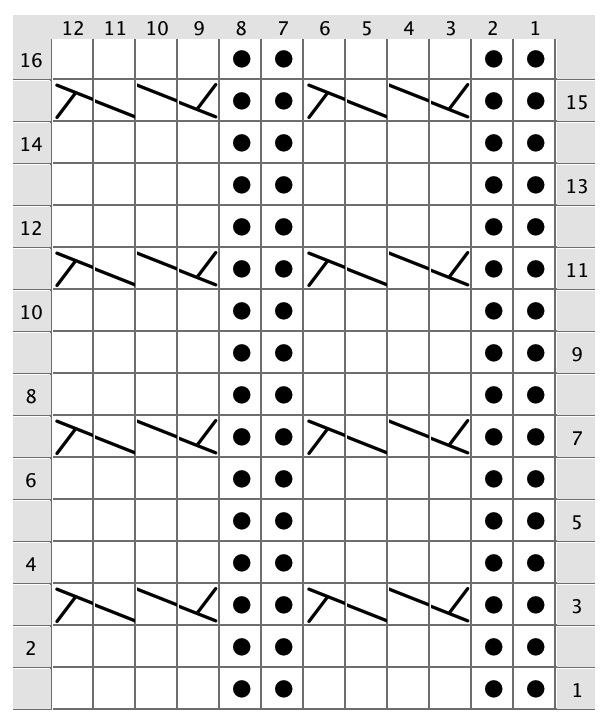 It also helps me better explain how the motifs work. Balance in knitting design is important. Balance gives viewers the feeling that all parts of the work are in equilibrium. In knitting, this sometimes means the stitch elements are symmetrical, vertically and horizontally. I use the term symmetrical but there are many asymmetrical designs, they are also balanced by other means. Vertical-design moves vertically with spacer stitches in between. Horizontal--design moves horizontally for a set number of rows and needs to be centered. Tessellated-design moves both horizontally and vertically. Also called all over pattern. 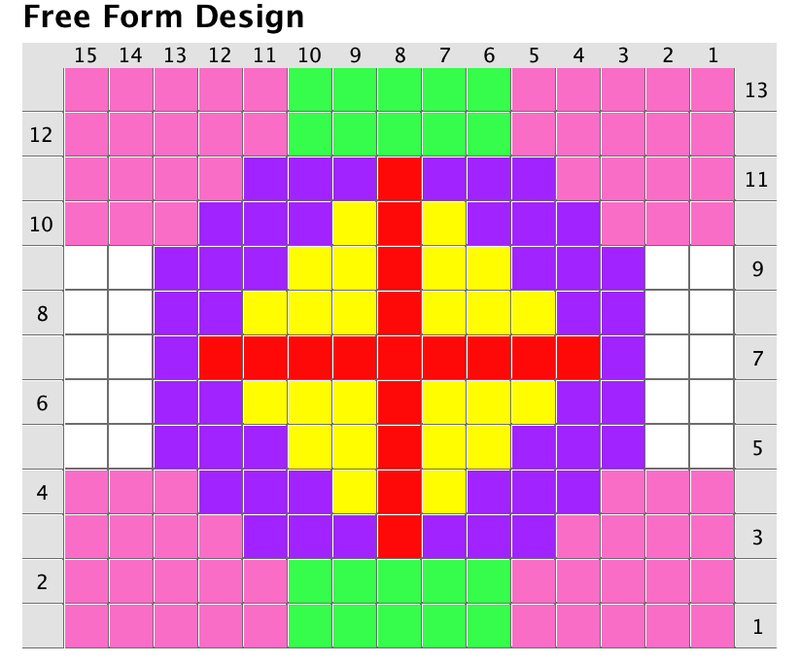 Free form--design has limited or no multiples and repeats. Lace, Color and Cable patterns can be all of the above. The charts show more than one multiple and repeat to illustrate the type of design. 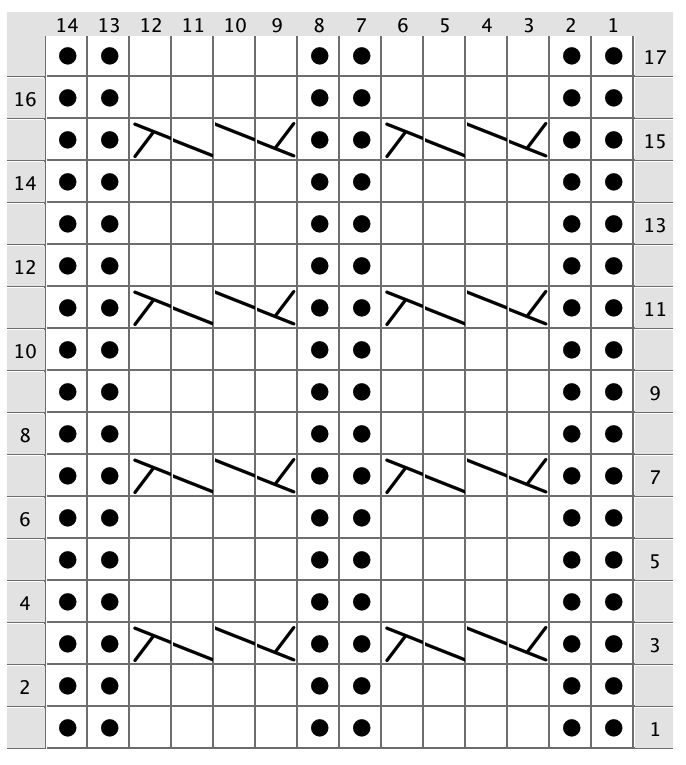 Notice the motif moves vertically. I must have more motifs on top of the original for the design to make sense. Here the design moves horizontally. I could place the same design above or a different design and this basic motif won't change. Moving horizontally produces the patterning. Her the design moves both horizontally as well as vertically. Notice there is no multiple or repeat. This picture stands on it's own without the need of another motif. When should you use a chart? A chart should be used if it will clarify the directions. 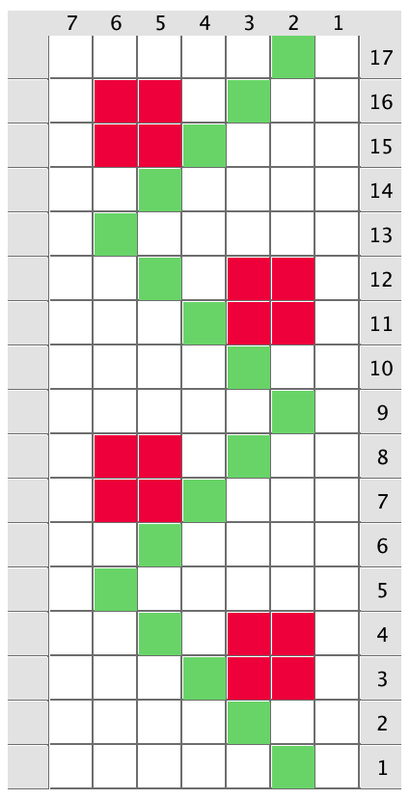 Sometimes it is easier to use a chart rather than written row by row directions. The difficulty of the pattern will determine whether you will use one or the other, or both. For some patterns it is much easier for the knitter to use a chart, because they can track their work on the chart with highlighter pen, post its, etc. For complicated directions, it is easy for the designer to make a mistake in the written directions. A chart allows you to see the right side of the fabric with the stitches and colors in place. For advanced patterns where the directions are more clear using a chart, it is safe to assume that the target audience will have the skills to work from that chart. 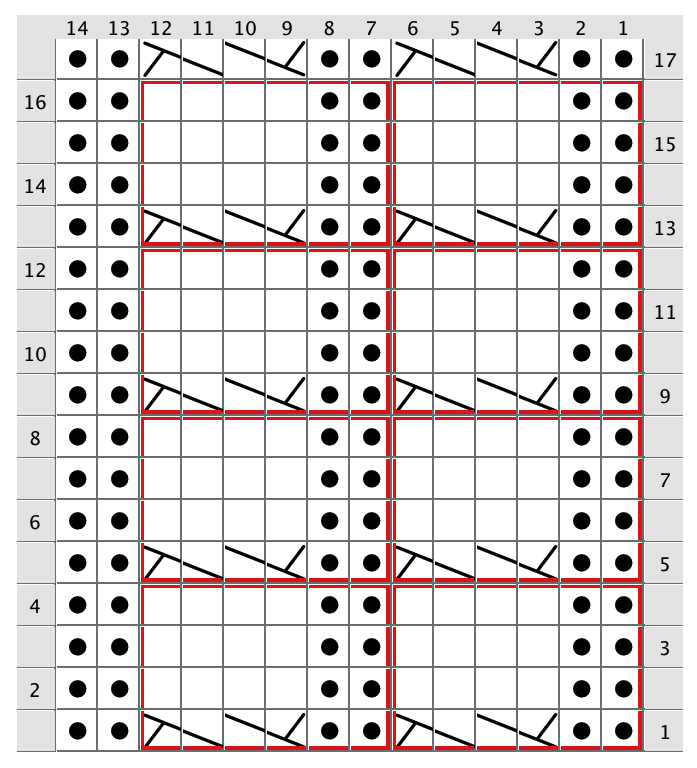 Charts can be used to show stitch work (cables and texture), color work, lace and a combination of the three techniques. The general directions must tell how to work the chart. Each chart needs a title. Refer to the chart title in the general directions. Number RS rows along the right margin. Number WS rows along the left margin. 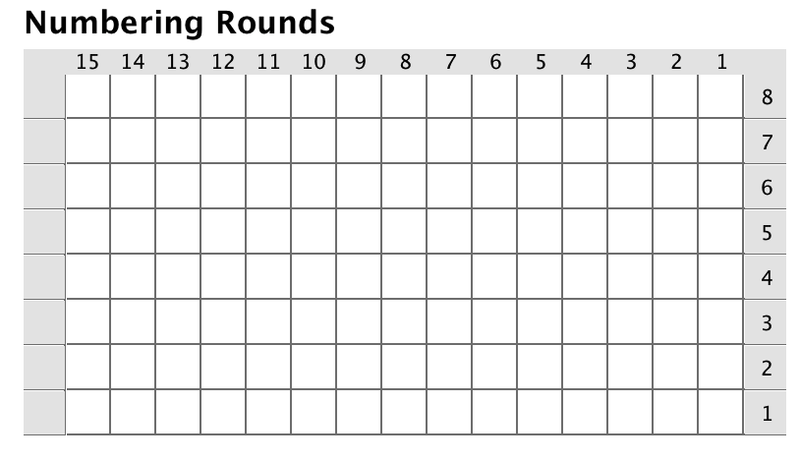 Charts in the round should be numbered along the right margin for all rounds. Stitches should be numbered along the top or bottom. If only RS rows are charted, there must be directions for working WS rows. 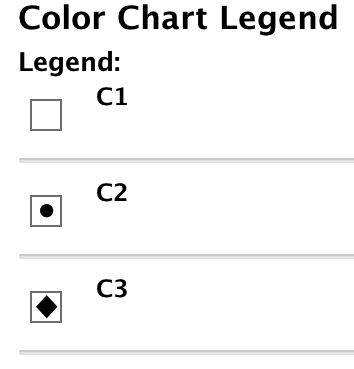 All charts must have a legend or key. Abbreviations must match the abbreviation section of the pattern. Defines symbols, color designations, or both. If using abbreviations, the abbreviations must match those in the Abbreviation Section of the pattern. May or may not give directions. If directions are not given, they should be stated in the abbreviation section of the pattern. Only one legend is needed for each pattern. This legend only gives the abbreviation or name of the symbol. The directions or definition would need to be provided in the Abbreviation Section of the pattern. The abbreviation or name must be the same on both the legend and in the abbreviation section. 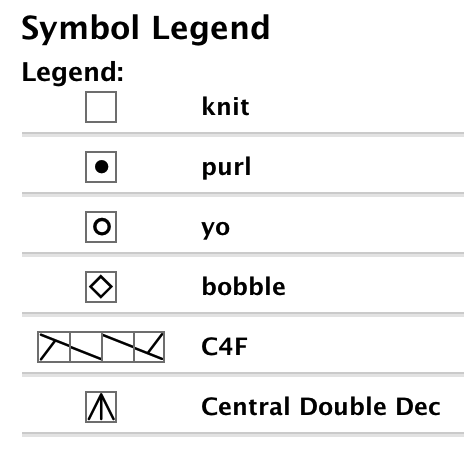 This legend gives both the abbreviation or name of the symbol as well as directions for working that symbol. It's always a good idea to include these in the abbreviation section as well. 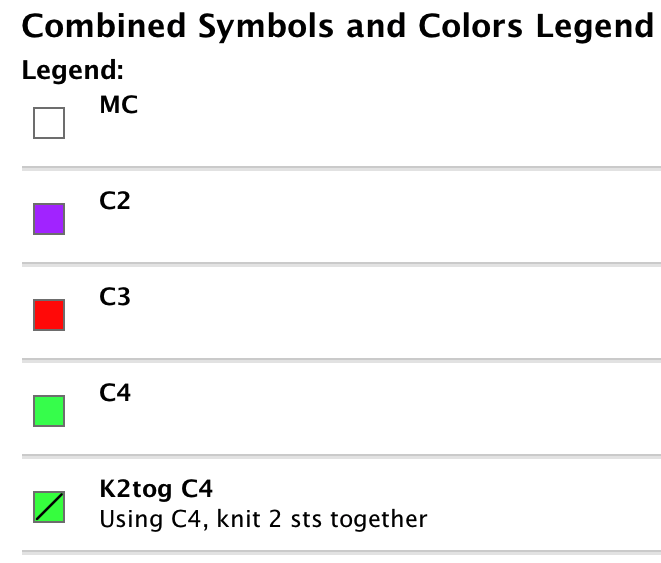 Color legends can use symbols, a color or a combination. This legend uses symbols to represent different colors. This legend uses a colored cell to represent each color. This can be confusing if the knitter decides to substitute colors in the pattern. Colored symbols used to represent the different colors. Symbols placed in colored cells. In this instance the symbol is relates to the color. Sometimes you will need to use a stitch symbol along with a color symbol. In this pattern two stitches will need to be knit together using C4. Work in st st according to chart, slipping stitches as indicated. I I am a TKGA certified Master Knitter and current co chair for the review committee. When I am not knitting I am looking after a husband, daughter, 3 cats and 2 horses. How General Patton and Some Unlikely Allies Saved the Prized Lipizzaner Stallions. Dr Mark E Peterson, Veterinary Endocrinologist Good site and blog. You can also follow him on Facebook. Cat Info.Org --Lisa A. Pierson, DVM-- Feline Diabetes --- This is an awesome site packed with useful information. ADW--American Diabetes Wholesale Glucometers, syringes, and other supplies.